We have some free baby patterns and tutorials to tell you about that will assist the crafts-minded mom-to-be that is looking for baby quilt patterns, crochet and knitting patterns and sewing patterns to help pass the time during her pregnancy, keep her mind busy and more importantly save money on baby bedding, curtains and nursery decor. Can you guess the most popular baby shower gift that costs less than $20? There is something very soothing and satisfying about making our own baby's clothes and quilts. Sewing not only makes completing a baby's layette less expensive, it gives moms an outlet for all that bottled up creativity. Most sewing moms are on a budget of some kind, so swapping patterns, fabric and yarn with other moms or finding free printable patterns is a real bonus. The reason free patterns are so popular with mothers who sew is that the most articles of infant clothing don’t ever go out of style. Modifications and updates on classic diaper shirts and gowns may be made along the way, but the basic designs stay the same. Another excellent reason for trading knitting patterns for babies, blankets and quilt patterns for piecing beautiful baby quilts is that new ones are expensive! When I see vintage store bought patterns that cost less than a quarter, I just have to laugh and wonder if the original owner of these old patterns would have found it funny that today's modern baby patterns cost over ten dollars apiece! Do You Have the Sewing Skills and Equipment Necessary to Make Baby Clothes? Go HERE to see if you have everything you need. Speaking of antique sewing patterns for babies, I have some of the baby patterns that a great-grandmother of a friend used to sew baby clothes, knit baby blankets and crochet booties her children. I can’t begin to tell you how precious the hand written antique knitting and crochet instructions are to me. The crumbling newspaper patterns for vintage baby gowns and dresses that had to have been drawn from her personal designs are fascinating! I have been able to identify dresses in pictures that were made from these very patterns. One of my favorite baby patterns that I have in my possession came from an antique trunk that belonged to one of my ancestors. It’s a hand drawn pioneer bonnet pattern. I’m not saying that I feel that a pattern for a bonnet that pioneers used on their treks across the country is more valuable than baby knitting patterns, crochet or clothing patterns. The reason I am so thrilled by this sewing pattern over some of the other baby patterns is that I actually own a blue calico bonnet for a child that was made on an old treadle sewing machine by the lady that drew the pattern and used her scissors to cut the pattern out of paper. Some might believe that with all of the cheap, imported baby clothing that’s available at the discount stores today, there’s no reason to make use of baby quilting patterns, crochet booties and caps or sew baby clothing until our eyes are tired. These people just don't understand the satisfaction that we get from every stitch and then from enjoying the finished products. The skill of knitting, crocheting and sewing beautiful things for babies from scratch will always be admired. I like to think that someday one of my great-great grandchildren will come across my baby patterns as be as thrilled as I was when I found my ancestor’s baby quilt patterns. Please feel free to send your photographs of your baby sewing projects to us! We would be ever so honored! Please include all the special details of which delicate baby yarns, fabrics and notions that you used as well as color names, etc. Sewing for baby is a fabulous pastime, and an opportunity for your completed piece to be included in our website’s gallery is pretty cool, too! 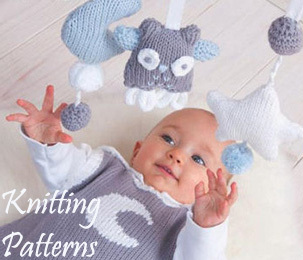 Knit or sew your baby items using any patterns you like and then snap some pictures to send to us. What a great way to make some baby crafting connections and build a sewing community without ever leaving your house. I would love to know what you think of our site! Leave me a comment in the box below. Ebay Partner Network and others. Copyright © 2006-2018. All Rights Reserved.